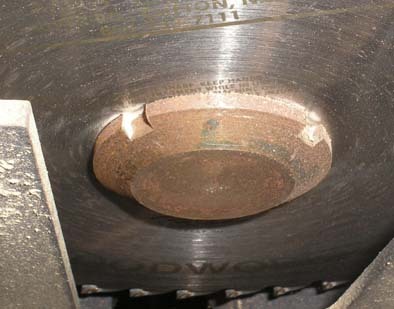 In keeping with Robland's preference for Unique Parts, the saw's arbor "nut" is NOT the more common hex nut. Instead, Robland went for the more aesthetic look of a short cylinder with a tshort runcated cone on top of it. (Apologies for the rust, but Peter T - a member of the Yahoo Robland X-31 Group - needed some photos to send to Laguna Tools to make sure he got the right saw arbor nut wrench - and I didn't take the time to make things look pretty and shiny). The "arbor nut" is actually a bolt - with this weird head on it. The bolt goes through the saw blade and threads into the saw arbor shaft. And of course that means it requires a special "wrench" to loosen and tighten. But, again, in keeping with Robland's "make a better mouse trap" - they took the British "spanner" wrench idea and improved it. The angled "handle" was a nice design feature as it gets your hand away from the teeth of the saw blade when tightening or loosening. 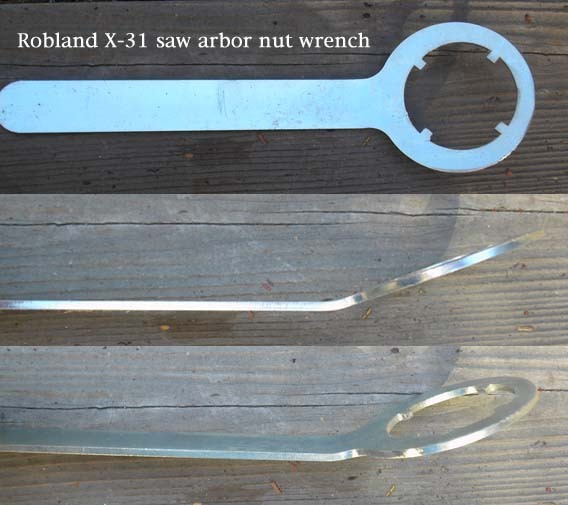 MAKE SURE, is you need to order an "abor nut wrench" from Laguna Tools, that you send them the two images shown above - or they may send you THIS.